In the year 2002, I had exhibited several painting at Manasthala Foundations, Chennai, on the theme of “Mother and Child” (தாயும் சேயும்). For this exhibition, I had chosen the basic emotions that bind 'mother and child', and tried to depict how these emotions get expressed in their interactions. Motherhood being a universal phenomenon, I felt it is best not to personify the mother in full detail. Hence, in my compositions, I had represented the mother rather discretely, whenever possible. I had chosen to work with ‘Indian ink’, as one can achieve depth very easily with this medium. In addition, the monochrome palate helps create dramatic effects! 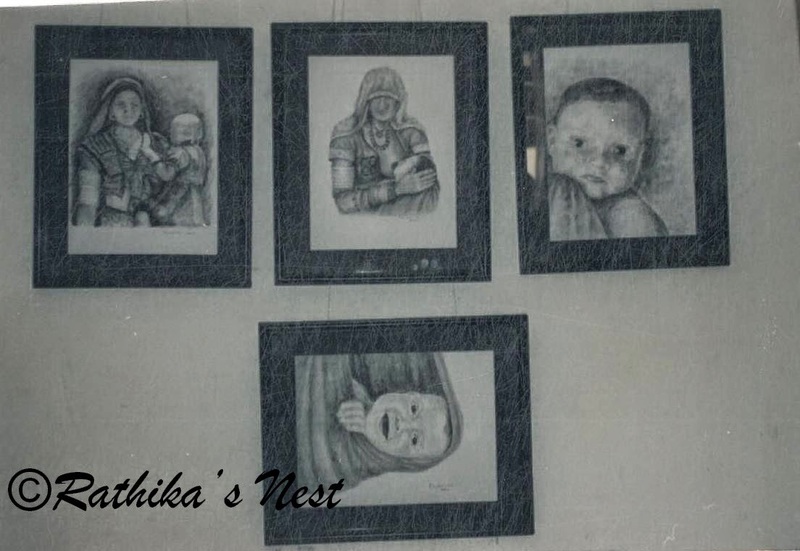 In this post, I am happy to share with you, some of the paintings exhibited at Manasthala Foundations. Mother and Child – this painting depicts the usual way a mother carries her child in our society. In doing so, mother communicates her love and warmth through physical contact, and the child feels secure in mother’s hands. Awakening – this painting depicts a baby looking out of ‘thooli’(தூளி) on waking from sleep. Traditionally, babies are made to sleep in a baby rocker called 'thooli', which is nothing but a cotton cloth tied with a rope to a rod or hook in the ceiling. A colorful wooden rod separates the ends of the cloth to allow more space for the baby. The cloth covers the baby’s sides snugly making the space cosy to sleep. It is always a beautiful sight to watch the baby trying to push the cloth and look out once awake.